Fact: Great après drinks make for even better stories about the day’s runs. 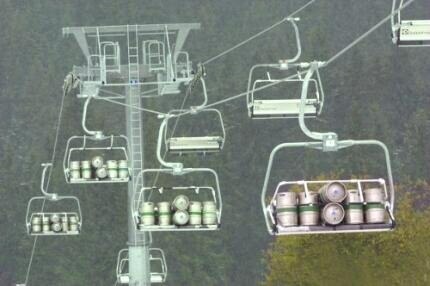 Luckily, many ski bums are opening craft alcohol operations. Take the 10th Mountain Whiskey and Spirit Company. The Kickstarter-funded operation was founded by two Vail locals who realized that distilling—unlike skiing—would pay the bills. And it’s not just happening in Vail. One look at this map of microbrewery distribution shows the astonishing connection between microbreweries and top ski areas. The Jackson Hole region alone is home to 27 microbreweries, while the I-70 corridor between Denver and Aspen boasts 19—and that’s not including Boulder. Roadhouse took home six medals at the 2014 Best of Craft Beer award, so your options will not be limited. And they go beyond drinks. The brewery has two locations—the brewery and tasting room and a brewpub and restaurant. “Good beer, hip interior, popular with locals who sit at the bar while tourists sit at the tables,” says Laura Goforth, a ranger currently stationed at Grand Teton’s National Park.